MASS MURDER OF WHA;ES IN FAROE ISLANDS. Whaling in the Faroe Islands is the slaughter of long-finned pilot whales when they are driven to swim near the islands, and has been practiced since about the time of the first Norse settlements on the islands. Around 1000 pilot whales and some Atlantic white-sided dolphins are slaughtered annually, mainly during the summer period. And such act of murders is not far out from Japanese fellows. It all presented like organized sporting "Grindadráp Grind" events where the whales are chased into a harbor and killed by the locals with knives while their family members watch and cheer them on. It is nothing less than killing of defenseless mammals for fun by sick minded people. Anyone who has a special training certificate (or certificate to kill) on slaughtering a pilot whale can participate. In the past such certificate wasn’t necessary, but Faroese people become more “civilized” and improved their slaughtering methods in order to make them more “humane”. And here is the killing procedure: two deep cuts are made on either side of the animal’s neck, causing the head to drop forward, then a third cut is made through the middle of the neck down to the carotid arteries and spinal cord. After a period of violent thrashing the animal is paralyzed and loses consciousness, dying of blood loss in most cases. Many Faroese consider the whale meat an important part of their food culture and history. Animal rights groups criticize the harvest as being cruel and unnecessary. Yet, these people do not consume whale meat anymore due to high level of toxins. In 2008, Høgni Debes Joensen, chief medical officer of the Faroe Islands and Pál Weihe, scientist, have recommended to the Faroese government that pilot whales should no longer be considered fit for human consumption because of the high level of mercury, PCB and DDT derivatives. However, the Faroese government did not forbid whaling. 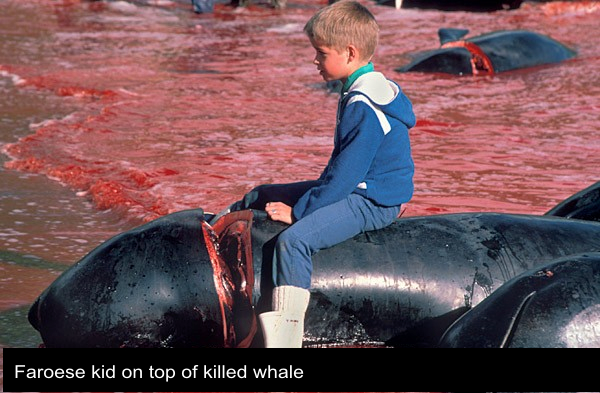 Of course, the Faroese can argue that whale slaughter is no different from slaughter the other animals by humans. Yes, it is a truth but to make of it a killing show and celebrate such tradition raise the in such brutal environment it is unacceptable. But for now, at least what we can do is to oppose such brutality and return to the animals their freedom and right to live. Please, share and show the world the brutality of their culture. We need to stop this violence and give respect to other life as highly intelligent living creatures. Save the oceans and all life in it.